Common aliments that the dwarf frog hobbiest may come across. Dropsey/bloat - intense swelling in the body and legs. 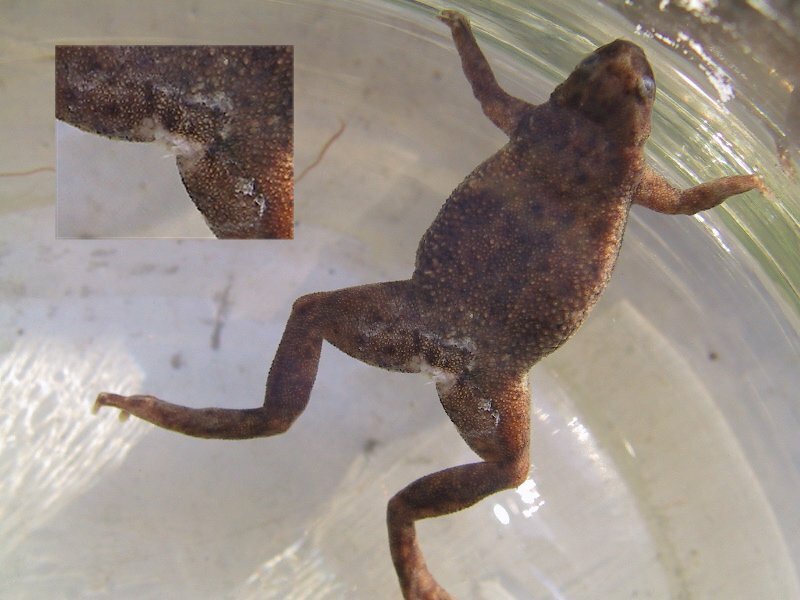 Fungal Infections - white, cottony looking patches or threads on the frogs body. Bacterial Infections - may have no physical symptoms. Frogs would appear lethargic, refusing to eat, and spend a great deal of time floating at the surface in one spot. There is no known cure for Dropsey and in most cases is fatal. Other frogs can contact this in the same tank. Remove the infected frog and treat the other tank as well. I would treat with an antibacterial medicine along with aquarium salt. I suggest using Maroxy for treating sick frogs since it is safe for all invertebrates. Keeping the water very clean is also key to curing frogs. For fungal infections use an antifungal medicine along with some aquarium salt. Most fungus can't live is water where traces of salt is present. The only time a Dwarf Frog really hurts iself is on tank decorations or from being handled too roughly. Please remember when setting up a tank or adding dwarfs to a commuity tank that you remove decorations that are sharp or have a very course texture (fake corals). Also, aggresive fish such as cichlids, gourmis, catfish, loaches, etc. 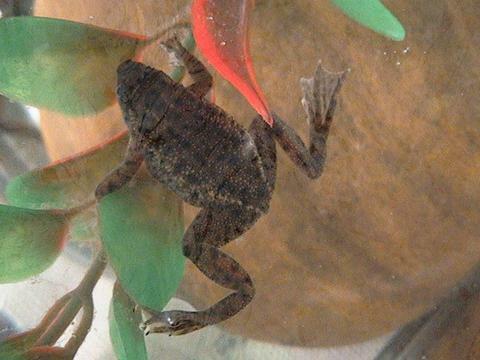 are known to attack dwarf frogs and bite off their arms, legs and even kill them. Wounds/Sores - caused from bites by agressive fish, rubbing up against too rough a surface, or sharp aquarium decorations. This could also be a symptom of an illness. Remove the frog to a hospital tank until it heals on its own. 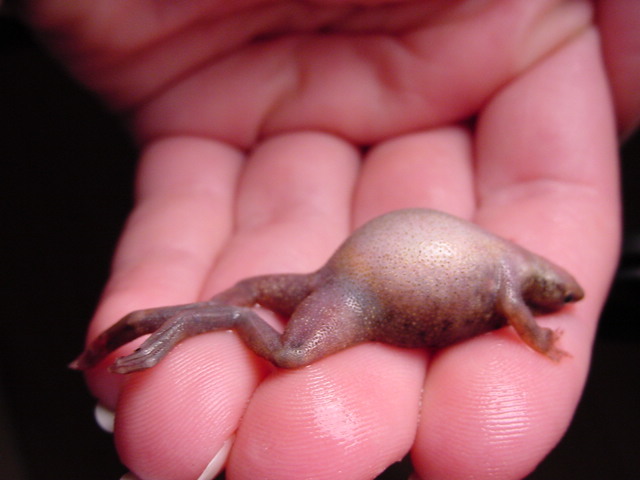 Broken Bones - By handling these frogs too roughly their bones can easily break. They are very delicate creatures and even netting them can can break toes and limbs. Torn Webbing - This occurs quite often with plastic plants. Nothing to be alarmed over, it will grow back on its own. But i suggest using real or silk plants to prevent this. Missing Toe Nails - They will grow back on their own. Could be a sign of a calcium deficiency, make sure you are including reptomin or other specially formulated pelleted food that is high in calcium. Impacted - Most aquarium gravel is too large to be eaten by a dwarf frog. But if you suspect your frog has eaten a piece of gravel you will need to feed him soft foods (frozen beefheart) until he passes the gravel.